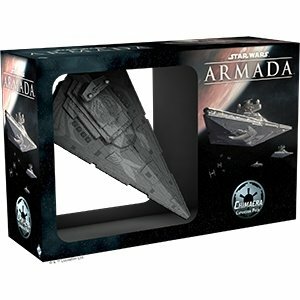 Grand Admiral Thrawn arrives to the battles of Star Wars™: Armada in the ChimaeraExpansion Pack. Along with the chance to command your fleet with this brilliant, blue-skinned Chiss tactician, the Chimaera Expansion Pack introduces an Imperial Star Destroyer adorned with a distinctive chimaera design, two Mandalorian Gauntlet squadrons, six ship cards, and seventeen other upgrades. Altogether, these materials don’t just give your Star Destroyer a different aesthetic; they allow it to fill entirely new tactical and strategic roles within your Imperial fleet.